• Personnel Records, allows you to maintain records on all of your staff, including information on CEU & Division recertification tracking. It includes automatic generation of expiration warning and suspension letters as well as OEMS documentation regarding Basic Skills and Recertification. A Memo tool is provided for making brief, general or personalized announcements to the staff. 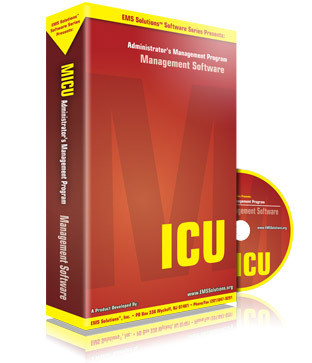 • NJ OEMS MICU Regulations provides you with an electronic compilation of the regulations governing a MICU in the State of New Jersey. The file may be searched for topical items or by regulation number to extract immediate documentation. • MICP Student Records, allows you to maintain records on all of your MICP students regarding their credentials, quiz scores and skill hours within their didactic and clinical programs. A Memo tool is provided for making brief, general or personalized announcements. • Equipment Module provides maintenance tracking of your hard assets, with on-screen alarms for action items. A companion Inventory Module assists with tracking incoming inventory and the associated costs. • Vehicle Service and Vehicle History Modules provide tools for maintenance history and vehicle down-time logging, as well as cost analysis.